Elfin Patch: Shopping in my Stash. about all the fabric in my stash. My friend Alison was sorting out her sewing room, folding and sorting out her stash, and I am not sure which of us has the most fabric, believe me we have a lot. I was pretty ashamed of us both. So this week I have shopped from my stash. Its not a big quilt I have put together, at the moment it is aprox 40" x 40", not sure if it is going to get a border or not yet. Quilt so far, might add a few more leaves. The pattern is by Edyta Sitar from Laundry Basket Quilts,and is called Rainy Day Trio. It takes just 4 fat 1/4's for the background, and scraps for the appliqué. I just love the background. This little quilt is going to be machine appliquéd, and hopefully hung on the wall in my guest bedroom. To say the least, I am feeling very pleased with myself, as everything was from my stash. 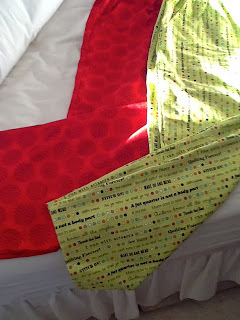 And as Jenny of Elefantz said give the fabrics in your stash a "Moment to Shine". I finished the two pairs of PJ's bottoms too, so a good sewing weekend. All in all, it was a good weekend. I even had a lovely email from the Designer, Deborah Kemball, encouraging me on my BOM Floral Impressions. She is here in the UK, meeting up with Michael from the wonderful Oakshotts Fabrics. I wonder what they are cooking up, whatever it is it will be beautiful. Now I must get on with our BOM. I have not yet stitched block 9 or written the instructions, it's all still in my head. I also have to go and makes some muffins as we are at the Bee tomorrow.